Remember when everybody was freaking out about where the Dodgers power would come from? Well today they added four more homers to their MLB-leading total of 28 to power past the Giants by a score of 7-3. The fireworks started immediately in the first inning, with Joc Pederson newly in the lead-off spot and christening it with a bomb, followed by an Adrian Gonzalez solo shot, and an Andre Ethier two-run homer. Jimmy Rollins followed with a homer of his own in the third, and sacrifice flies from Scott Van Slyke and Zack Greinke made it 7-3. On the other hand, the Dodgers starters have continued to struggle a bit to give the team innings. Zack Greinke had to extend himself to 110 pitches just to get through six, giving up three runs on seven hits and two walks while striking out six. While the bullpen appears to be very strong and deep this year, which is great, if they have to get 9-12 outs every game, one of the guys in the middle is bound to get exposed. In any case, it could’ve been a lot worse for Grienke without Ethier saving his bacon with a wonderful diving catch in right. The bullpen that you couldn’t ask much more from shut the door yet again, with Adam Liberatore (1.25 FIP), Chris Hatcher (1.34 FIP), and likely god Yimi Garcia (0.65) going three frames of perfect ball, striking out four. -In addition to his homer, Pederson walked, struck out, and lined out sharply in his debut at the top of the lineup. 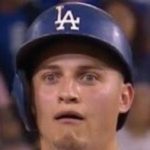 Joc saw 17 pitches in his four plate appearances. -The depth is silly to the point that the Dodgers fourth and fifth outfielders have lines of .393/.471/.643 (SVS) and .304/.400/.587 (Ethier). Previous iterations of this team would’ve been hammered by the injuries suffered so far, but this team seems to thrive off it as new players want to take advantage of opportunities given. -A-Gon made probably the weirdest error of the year so far, failing to catch a routine throw from Rollins at short.